Are public transport trips longer (than car trips)? I’ve frequently mentioned that trips by public transport in Melbourne are longer on average than those by car. The exhibit above illustrates that difference using data from the Department of Transport’s VISTA data base. It shows the length of non-work trips in Melbourne by private vehicles versus public transport. For all practical purposes, it’s cars on the one hand (in red), versus trains, trams and buses combined on the other (in blue). A ‘trip’ refers to travel between main activities. Where multiple modes are used on one trip a single ‘main mode’ is defined. For example, if a person drives from home to the station, catches a train to the city, and walks to their destination, their mode for the trip is the train. It’s important to get these figures in perspective from the outset. There are almost fourteen times as many non-work trips made by car as are made by public transport. This reflects the dominance of private transport in Melbourne. It’s evident from the exhibit non-workcar trips are substantially shorter – just compare the two fitted curves. In fact 56% are less than 5 km, whereas the corresponding figure for public transport is 27%. At the other end of the scale, 5% of non-work car trips are longer than 30 km, compared to 9% of public transport trips. Work trips (i.e. commutes) tend to be longer than non-work trips in the case of both private and public transport, but again public transport trips are longer on average. 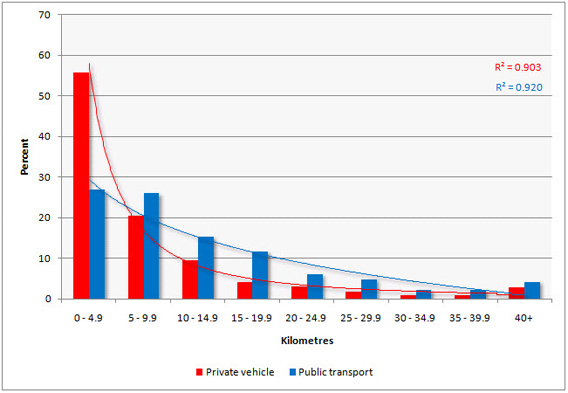 For example, 40% of commutes by public transport exceed 20 km. The corresponding proportion for car commutes is much lower, at 27%. I’ve shown non-work trips in the exhibit because they account for around four fifths of all trips (defined as per above). They are not as dominant in the case of public transport, but still comprise two thirds of all trips by trains, trams and buses. Trains are the key reason public transport trips are so much longer – people travel considerably further on metropolitan trains on average than they do on buses and trams. I don’t have data to hand that separates out trains (I hope to get my hands on it shortly), but the difference between cars and trains would be much more dramatic. It’s not that the train out-competes the car for long trips. In fact many more people still prefer to use the car for long trips than take any form of public transport. For example, while 7% of non-work car trips are over 25 km compared to 14% of public transport trips (they’re virtually all train), the car trips number 534,000 per day. The comparable number of trips made by public transport passengers is just 80,000. Rather, people who choose to travel by train are more inclined to use it for longer distances, on average, than car travellers. I’d say that’s largely because Melbourne’s train system is designed to transport people across long distances – primarily from the suburbs to the city centre. Cars are flexible and in non-congested conditions can get travellers to a range of dispersed destinations, both near and far. Melbourne’s train system on the other hand is relatively inflexible by comparison. It essentially leads to one destination. That destination happens to be an extremely important location in terms of employment, leisure, cultural and social opportunities, so people are prepared to travel a long way to get to it. Because of congestion and high car parking costs, trains can often out-compete cars for this particular class of journey. Commuting is the obvious example. It’s not unfair to characterise Melbourne’s CBD-focussed train system as a one-trick pony. It needs much more integration so it can provide access to many more destinations (think along the lines of the PTUA’s “Every 10 minutes to everywhere” campaign). The idea of a public transport network – a system – needs to be promoted. That’s why it’s disappointing to see Kenneth Davidson advocating a rail line down the centre of the Eastern Freeway to Doncaster in The Age on Monday. It might enhance the lives of Doncaster residents somewhat, but it wouldn’t do much to boost the strength of the network as a whole. In my view, system-enhancing expenditures like the Melbourne Metro (or if you prefer, other ways of achieving the same objective) should get priority.